Job growth has remained vibrant despite the slow-growing economy, and that’s a trend investors are anxious to see confirmed in the February employment report on Friday. growth around 1 percent for the first quarter, the labor market has been strong, and economists expect to see 185,000 jobs added in February. The economy is widely expected to bounce back in the second quarter to a pace well above 2 percent, after the temporary headwinds from the government shutdown and polar vortex abate. The jobs data tops the list of important economic news in the week ahead, particularly after a string of disappointing reports showing that both consumers and businesses have pulled back. The stock market will pass a major milestone on Wednesday—the tenth anniversary of the day the market bottomed in 2009, when the S&P 500 hit 666. The S&P has gained more than 312 percent since that low of the financial crisis, and some analysts see the bull market continuing for at least another year. The S&P 500 is taking aim at the 2,800 level, an important milestone that it has struggled to surpass in the past week. The 2,800 marker was an important level for the stock market four times in past several months, and holding above it could signal the rally could drive stocks to fresh highs. Palfrey said investors first and foremost are looking at any information that can help them gauge how the economy is doing. “We’re looking for confirmation in the jobs report. We think the economy is doing okay. Labor participation is improving. We’re going to see that continuing to inch back up,” he said. 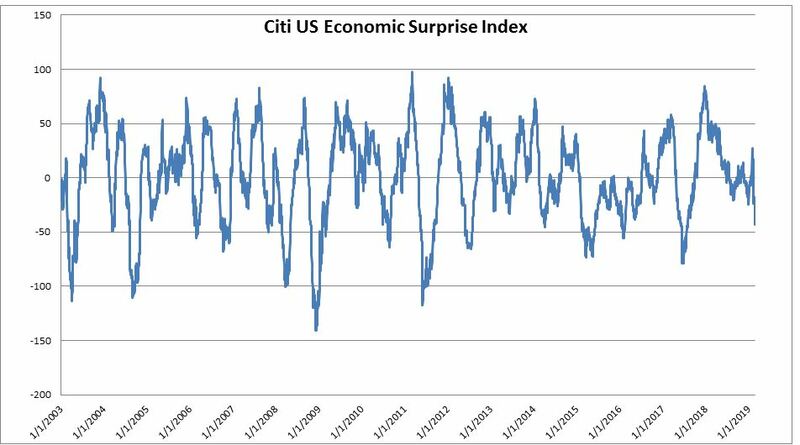 The Citigroup economic surprise index fell to a new 18-month low Friday, following a recent rash of disappointing reports. When economic reports come in below economists’ expectations, the surprise index falls and a low number for the index is reflecting the economic slowdown. Goldman Sachs economists Friday said they were expecting first quarter growth of just 0.9 percent, but they raised second quarter growth to 2.9 percent. In addition to the jobs report, there is the Fed’s beige book on the economy Wednesday and new home sales Tuesday. But after delayed and weaker data, it’s the jobs report that matters most. The employment report is one data point that has been released as normal through the shutdown, and in the January data, there was a huge upside surprise of 304,000 nonfarm payrolls. “All eyes are on the job market. If businesses lose faith and they stop hiring, and job growth starts slowing, then we do have problems,” said Mark Zandi, chief economist at Moody’s Analytics. Economists expect wages to rise by 0.3 percent and unemployment to fall a tenth to 3.9 percent, according to Refinitiv. “I think companies should stay steadfast in their hiring,” Zandi said. He expects job growth of about 200,000 but notes there could be a payback for the huge amount of hires in January. “I think the economy is fragile, growth is below trend. It’s very vulnerable. The only thing that will keep it together is if businesses keep hiring and the job market holds up, and I think it will unless the president doesn’t settle with the Chinese on trade, or there’s a hard Brexit or some other geopolitical event,” said Zandi. The Federal Reserve has paused in its interest rate hiking because of the slowing economy and concerns about financial conditions. But the Fed could move forward on rates again, if inflation begins to pick up, and for that reason the wage data in the jobs report would also be key were it to show new wage pressures. There are a few speeches by Fed officials, including Fed Chairman Jerome Powell who speaks at Stanford University Friday night at an economic conference. “I think people are expecting some detail about a long-term loan operation,” said Marc Chandler, chief market strategist at Bannockburn Global Forex. The ECB is expected to allow European banks to extend the duration of some short-term loans. Chandler said the ECB could also push back on its time frame on raising interest rates, which it has said would not be until after the summer.